In all that time I lived in Pittsburgh, it became apparent that hot dogs are super important. And it’s not just about the classic Dirty O or D’s Six Pax & Dogz, which is one of the hot dog spots ever. 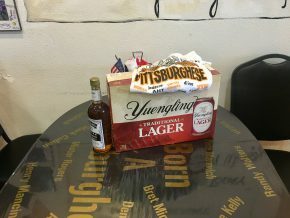 It’s about all the liquor stores that are allowed to sell booze because they also sell hot dogs because of stupid Pennsylvania alcohol laws. Yet, there’s no real signature hot dog. Enter: Wimpy’s Paradise in Chandler, Arizona. Yes, Arizona, which seems to be the center of the Pittsburgh Diaspora. Wimpy’s Paradise is totally unrelated to Wimpy’s in Rochester, New York and was started by a guy named Randy and was inspired by the fact that his dad had started a place by the same name in Pittsburgh back in the day. Despite living in Arizona for decades, Randy is a Pittsburgher through and through and couldn’t have been more excited about the case of Yuengling someone had just brought him back from Pittsburgh. 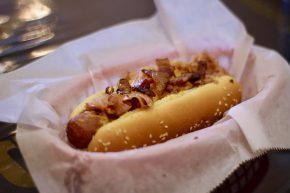 Thus, it is no surprise that he created a hot dog called The Pittsburgher. Chip off the old ham. 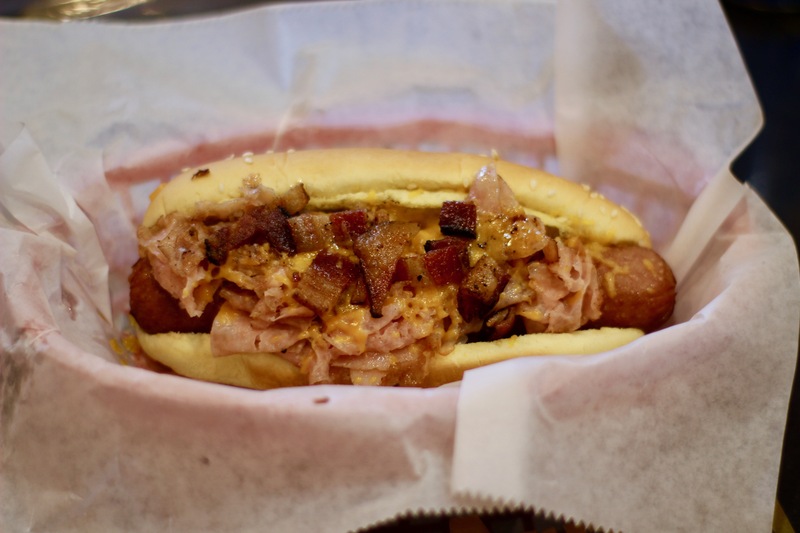 The Pittsburgher begins as a 1/2 pound all beef dog, which is then topped with chipped ham that is cooked with butter and cheddar cheese. Before I go further, I should say that I somehow managed to never hear of chipped ham, which is like a war ration version of ham that is somehow super popular in Western Pennsylvania outside of the Carnegie Mellon bubble that I existed in. At Randy’s suggestion, I also topped my Pittsburgher with bacon. And while that sounds like an overwhelming hot dog, it was actually just right. The toppings didn’t overflow and played really well with each other. The hot dog itself was plump, snappy and juicy, while the chipped ham was different from your typical ham, being sliced super thin and cooked all buttery-like. For ordering something that I thought would put me into a food coma, I left Wimpy’s Paradise feeling perfectly full, but most importantly energized by finding a little taste of Pittsburgh in the desert.